During what turned out to be an extended tower-raising project (Going from 55 feet to 90 feet), I had my beam down and I needed an antenna that could provide the necessary gain and angle of radiation to talk to my friend Skip down at the South Pole. A vertical would do the job but I live on a ranch with horses and some times they get out of the corral. The thought of having a bunch of radials where the horses might get tangled would not be a big selling point with my wife. These were her pets. Besides I had this vision of one of our horses tangled in the radials just as the local TV crew happened by. Now I would have PETA, SPCA, FCC, the building commission and who knows else banging at my door. Let’s not go there. I finally decided, why not build a “J:” pole for 20 meters? No radials to mess with, completely grounded and a low angle of radiation. 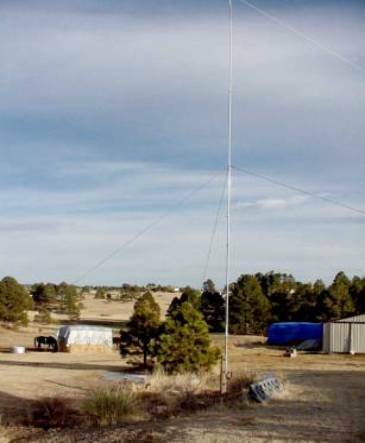 The “J” pole vertical is built from a fifty-foot TV push up mast. You could use a tower section or irrigation pipe. I had some push up masts available so I used one for the antenna. In the case with the push up mast you need to extend it out completely on the ground for measuring. That’s when I found out a 50 foot TV push up mast is actually about 43 feet long. No problem, just add some lightweight aluminum tubing to the last top section. Basic construction of a “J”-Pole antenna is for the top section to be ½ wave radiator with a ¼ wave matching section for the feed. The bottom of the feed section is actually a shorted ¼ wave autotransformer. Impedance at the bottom of the antenna is very low. You can mount the base to a wooden pole with no effect on performance. Measure down from the top of the pole ½ wavelength for your desired frequency. Using the formula 492/frequency (14.205 MHz), times the velocity factor for a 2-inch pole (.97) gave me the length of 33 feet 7 inches. For the matching section a quarter wavelength at my design frequency is 16 feet 9 inches. Mark the wavelength points with a felt marker so when you push up the mast you can attach the proper hardware as you extend the mast. The stand off for the top of the quarter wave matching section is made from schedule 40 PVC. A 2 inch PVC “T” with a 1 inch side insert that extends 7 inches is used to hold off the matching 12 gauge wire. The dielectric of PVC is more than sufficient to handle the voltages with 1500 watts. If you were concerned with higher wattages you could place a glass insulator at the top of the quarter wave wire matching section but I have found it unnecessary. The guy point rings for the TV mast were removed except for the actual sections that would have the nylon rope attached. This prevents lose metal pieces from rattling in the wind and causing mechanical conduction static. The antenna presents a very low wind loading and only need guying at the 30 and 40-foot sections. On the guy rings I attached the Nylon guy rope to small carabineer clips and attached the clips to the guy rings. This prevents the guy rope from fraying on the metal guy rings. The antenna has weathered 80 MPH winter ice and blizzards with no ill effects. The collapsed mast is attached to the wooden pole. This will take the work out of raising the mast until you can guy the antenna fully extended. If you don’t mount the antenna to a post you will have to guy the mast assembly at the10 foot point before raising the assembly. And now some safety guidelines. DO NOT ERRECT A TV PUSH UP MAST IF THE WIND IS OVER 5 MPH! DO NOT ERRECT THE MAST ANYWHERE NEAR OVERHEAD VOLTAGE WIRES! Wear Leather Gloves. An extended a TV push up mast is has cotter pins or bolts to prevent the sections from sliding down should the setscrews become loosened. When erecting the mast you fully extend each section and place the cotter pin or bolt into the mast to prevent the upper section from slipping down to the lower section. After setting the mast pin you rest the mast section on the pin and tighten the mast section bolt. Repeat this procedure for each section. On a stable ladder start extending the various sections starting with the smallest mast until you get to the first guy point. Attach your 40-foot nylon guy ropes. Extend the next section and attach the (30 ft.) guy ropes. Keep extending each section. At the ½ wave point from the antenna top you attached the PVC standoff with hose clamps. You can pre-make this assembly including the matching 12-gauge wire before raising the mast. Extend each section until the mast fully extended. Once the mast is fully erected set the 30-foot guys and then set the 40-foot guys. The hard part is over. Take a break the mast is not going anywhere. At the bottom end of the ¼ wave matching wire you attach the end to the metal shorting bar and attach the bar to the mast with a U bolt. The basic “J” pole is complete. The feed and ten-turn choke balun was made from LMR-400 low loss 50-Ohm cable. LMR-400 cable is made by Times Mirror Corporation as is available for about $.43 a foot in 500-foot quantities. You can find suppliers in the back of QST magazine. Loss at 14 MHz is about .45 dB. per 100 feet. To often I see hams put up a great antenna only to throw away signal in a lossey piece of coax cable. The end of the cable is attached with an “N” male connector. The feed point is connected with two 12-gauge wires soldered to an “N” female bulkhead connector. I use “N” connectors for they are gasketed and you don’t have to worry about moisture getting in the connector. The rear of the female connector is sealed with RTV sealant. The center conductor is connected to the matching wire with a copper ground split -bolt and the shield is connected to the mast with a cooper-grounding strap. Attach the feed about 9 inches from the shorting bar. The base of the antenna and shorting bar are grounded to a 10-foot ground rod. Using a VSWR Bridge or SWR Analyzer adjust the feed points up or down until you match is flat at the desired portion of the band. I have found the 2.0:1 VSWR to cover the whole 20 meter band with the 1.5:1 VSWR range covering from 14.100-14.310 MHz. VSWR center point was set at 14.205 MHz. The antenna is very quiet. The “J”-Pole is completely grounded. I live on the front range of Colorado and the humidity is very low. We can have very high levels of “P” static. Lightning is a great concern during the summer months and static build-up is a problem. 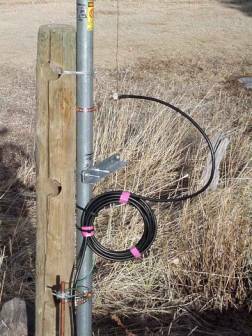 Before I started testing I placed two reference dipoles at 40 feet with one strung north/south and the other east/west. This was for comparing dipole to “J” pole signals over a two-week period. Stations that were closer than 500 miles were consistently the same signal strength or one S-unit stronger on the dipoles. This I attribute this to dipoles having a much higher angle of radiation. Stations over 800 miles away were 1-2 S-units stronger with international stations sometimes 3 S-units stronger. I can hear the critics saying maybe it was the polarization arrival but in each case I could switch to my horizontal reference dipoles each station on the band followed the distance observation. Out of 200 stations sampled over a 2-week period the results were always the same. On the air reports consistently had contacts reporting an average of two S-units stronger signal with the “J” pole when the distance was over 800 miles. When hams talk of antenna performance many quoted results of are antidotal. This basses of evaluation is because they are not using reference antennas or performing proper antenna modeling on an antenna range but empirically, “can I make contacts”. Well there is some truth in the old saying’ “can this dog hunt”. Alas the opportunity presented itself. A real test is how will the “J” pole antenna work against the 20-meter mono banders during a worldwide DX contest? About a month later I had my chance and I was amazed. On a Saturday in first week in March was the World Wide DX contest. You know the drill, S9+ noise level. Bottom line is I worked over 78 countries in six hours. Now I’m not going to kid you that I was running 100 watts but my old TL-922 linear with the “J” pole antenna would bust through the pileups and pull out a contact within the second or third call 90% of the time. Each time I told the contact the antenna was a half wave “J” pole they couldn’t believe the signal. Signal strength was generally within a S-unit of the KW monobanders. Actual signal strength during a contest doesn’t mean much. Each report is a higher layer of the liars club with some readings only possible if the S-meter was wired to the power supply. What I was learning was not only of how fast the contacts were coming but the relative difference from the Big Gun mono band beam stations. My results from over 3 months of operation now have me listening and calling CQ on the “J” pole first before switching to the beam. When the band is quiet you just never know where it’s open to. Versions of this antenna could be made with matching sections for 10, 15, 17 and 20-meter portions descending from the top of the antenna. This would be easiest using a Rohn 25 tower. Decoupling the different band coaxes would be accomplished by running down the inside of the tower. Building the antenna was great fun and took about 4 hours from start to finish with only two trips to the hardware store. 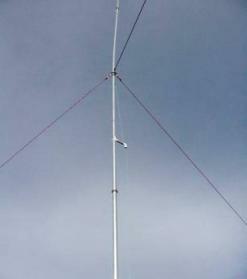 Since building the antenna, several hams in the area has built the 20-meter “J” pole to augment their DX antenna arrays. Contact surfing is a lot easier than constantly rotating the beam and is a great antenna for round robin rag chews. This is a perfect antenna for those who have limited yard space. Best of all you can erect this by yourself with a little planning. ¼ wave matching #12 ga. wire.